look best against the beautiful white snow! i can't resist this look seriously. the shades of your outfit is more than pretty. love your blouse and shorts! such a great pair! I loove this look on you. It's so fresh and not what people expect, esecially during the cold and grey winter months. Keep enjoying your weekend and the snow! this outfit is so amazing! i love every piece! Oh my goodness! You look so angelic in these photos! It's absolutely beautiful and I love the print mixed with the sheer pink top. Ah, absolute perfection. Such a cute outfit! You're right, the colors look amazing on the white snowy background! I really love the colors in this outfit; especially this shade of pink. Snow looks pretty BUT I'm really really happy that the snow has melted here. Hopefully it won't come back, I need it to be spring now! Sometimes I don't understand why people think winter attire should be gray and dull. Personally, I would rather see pretty colors to contrast with the gray weather. You look beautiful in these pinks and you make me think of Spring, which is something I need to be reminded of! i thought i had to wait for spring to wear floral shorts and semi-sheer blouses, but obviously i am wrong! you look gorgeous! i love your hair in that topknot, it looks so nice and messy i can never seem to get mine to look as good as yours haha. the colors here are so beautiful, really this is such a perfect look! I agree, those colours look so beautiful against the white snow, lovely as always Bonnie! About London, I'm still not there. I'm having a little vacation at my boyfriend's, just before I move to London. There's still some stuff I need to take care of before going there permanently. i love the blushing blouse its beautiful against the snow..!!!! Loving the outfit and you look so cute! I absolutely love that you chose to wear such spring like colors on a snow day! This is good inspiration for me, as I tend to drift into mostly grays & blacks this time of year, with colors being mostly pops of red but I imagine this would be such a pick me up on a dreary winter day to be decked out in pretty pastels & florals! Love it! that pink blouse is soooo pretty! 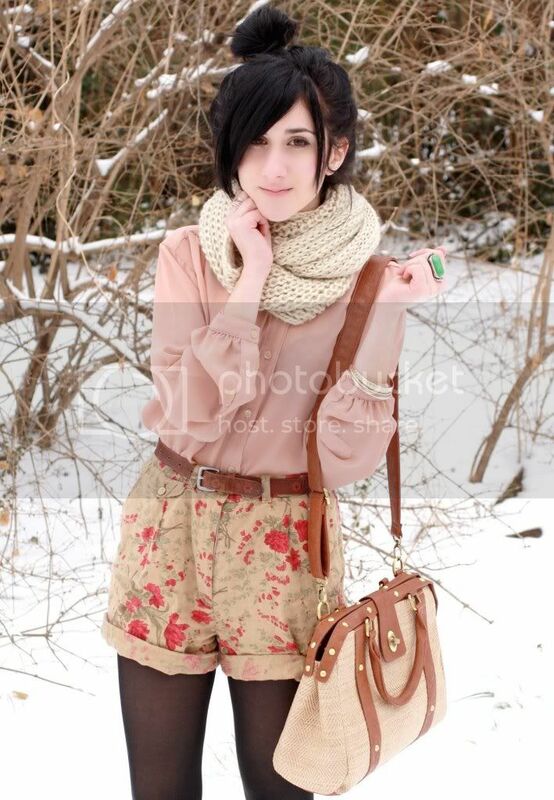 i thrifted one similar not too long ago ... i may have to do a little "spring flower in the snow" look myself! Absolutely beautiful look. The colours remind me of marshmallows! Which is a totally good thing, especially for such a dreary season. And the remixing is what i love best about your blog! You look so cute! I really love every single thing on you from this outfit! Looks like I need to go thrifting with you! I love the shorts, not sure if I would look good in something like that but you do! Can't wait to see more of your outfits. I agree that you don't have to go shopping all the time; use what you've got! Those shorts are so adorable! I NEED a pair like that for spring! But it also looks so lovely against the snow! You look exquisite ... Love the color combination!!! Aww, you look very cute! :) The colors are very sweet and cozy, especially with the scarf. And I like the ring a lot too! 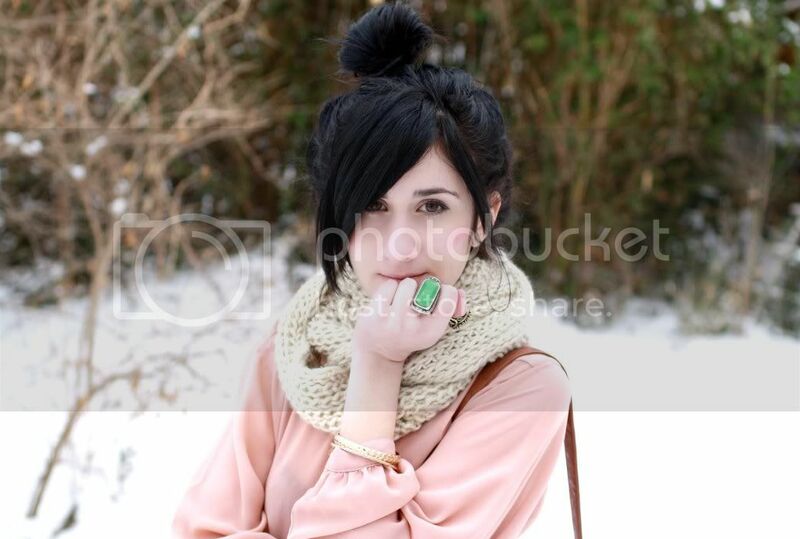 This makes for one adorably spring-winter outfit :D I love the cowl you are wearing. The stitch is beautiful. And yay for snow days! wow! amazing outfit, love the shorts, the blouse, such a soft beautiful colour! You are my favorite blogger! Pretty pinky, love those shorts! Totally love the colors you wore, snowy foggy days doesn't have to mean wearing black and grey! Totally loved the shoes they are lovely! Wine and snow? sounds like a blast! Hope you have a relaxing and weekend stay cozy! Love so much these pastel tones on you! The pieces are beautiful apart and together! You're so right, that pale pink blouses looks amazing against the snowy backdrop. Enjoy the snow! It started snowing here too. Again. Ok, this is my favorite look ever. Or I say that now haha but you look amazing and that top...so great! How did you not freeze, I would have chickened out in that cold haha! I am currently loving the pink, hun. You wear it so well too! ooh lady, that pink blouse is gorgeous! that's easily one of my most favorite colors and it looks just beautiful on you. I love the short and your outfit is so lovely! completely in love with your style! deff a new follower! perfection! it's been snowing a lot in NYC so is great!! your hair looks lovely.. love your hair up like that..
the pants CUTEEE.. of course you love florals... so do I.
was wondering if you would be interested in exchanging links? this outfit is just perfect. This is one of my favorites!! The colors are splendid & those shorts are sooo incredible. I love your rings too. You are absolutely gorgeous, girl. This is definitely one of my most favorite outfits of yours! This is just such an adorable outfit! I adore your shorts and the snow looks so lovely. Beautiful girl! gawd, you are so shallow. why do you base your being on clothes??? that concept is mundane and ridiculous. you basically live to wear clothes, what a shameful existence. maybe you need real therapy, not retail therapy. You look absolutely gorgeous! I love the blush colourtones :) Wish it snowed here. i love the print on your shorts, its a very pretty girly print! I love the whole outfit!! you're like a flower blooming in the middle of the snow! You look like a princess, totally! These pastel colours are made for you.Perfect! 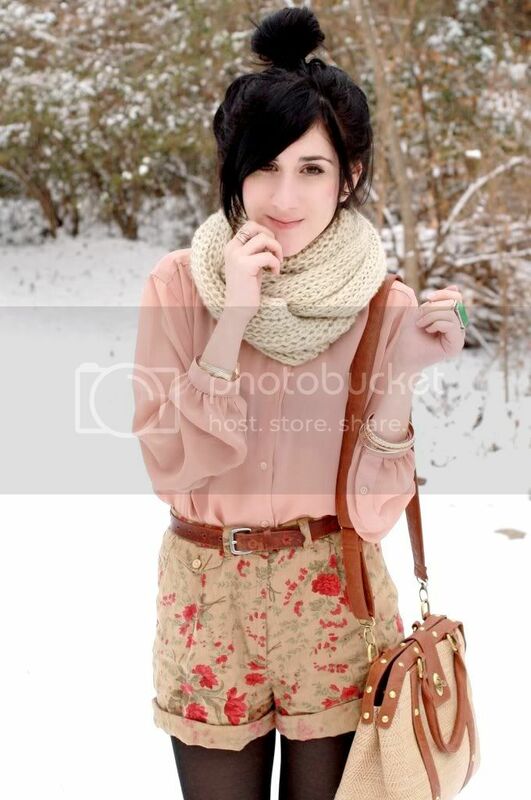 This is an amazing outfit, love soft colors in winter days. And your topknot is fab!! You look so beautiful ! What can I say ? Every your outfit is amazing ! love the choice of colour..
it really makes u look cute!! one of my inspiration outfits of the week! I absolutely love this. The colors are gorgeous and look amazing for winter. Thanks for the inspiration. oh wow! such a pretty outfit! i love your hair up so much! your post script is so conceited, as if you have the right to act like you know everything. love love love love love it!! thank you for your lovely comment! you look cute! You're very sweet in these pictures ! Pink is your color ! Wonderful Colors ! Trop belle ! But aren't you cold? I'm worried for you! is the firt time that i follow your blog but definity i will follow ok? I don't believe that one should devote their life to morbid self-attention, I believe that one should become a person like other people. I love the colors and tones of your outfit! :) Great ensemble. Pretty as a picture. And you got all those looks because your outfit so gorgeous. Great message at the end about wardrobe remixing. Sometimes it's hard to resist buying more and more. 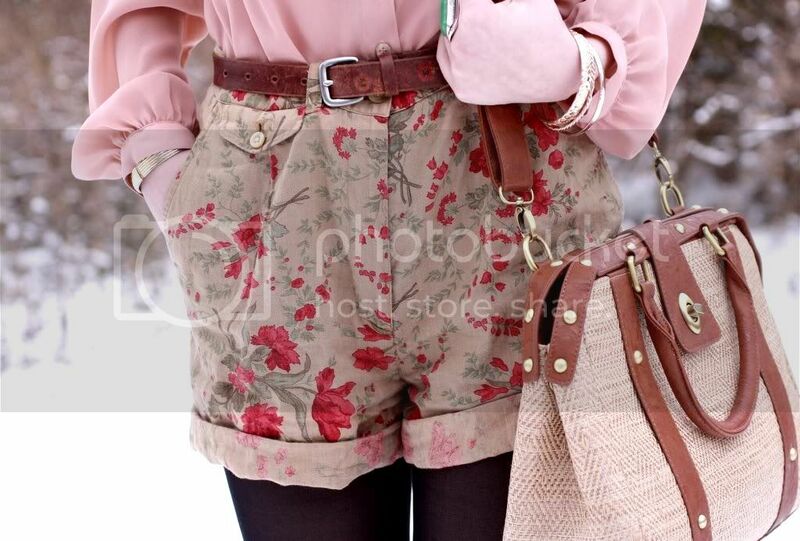 I love the floral print of the shorts, such a beautiful contrast with the surrounding white. This outfit is just gorgeous Bonnie! And over 2000s hypes! Wow! i love your shorts and your outfit! you do look like a budding flower against the white snow, I love it, another gorge look, u do no wrong!! this look is amazing. your sense of style is incredible and the floral printed shorts are beautiful. Love these pics! You really look amazing... as your boy said: "like a spring flower in the snow"! And your hair looks soooo cute! I love tights with shorts! Especially black! I LOVE this color combination. So pretty! I've always wanted to know...how do you wrap your scarf like that? It looks super cute and warm! I love this look, OMG! u look like a doll! Love your bag.. looks amazing! One of the best looks I've seen in a while! You sure know how to style an outfit. You look so amazing!!! Love this outfit more than everthing!! you know what I love so much about this outfit? It looks like you are an anime character or something. You look stunning and perfect. I really love how all your outfits are unique and stand out from the next! That's really wonderful!! Love how you look in pink!